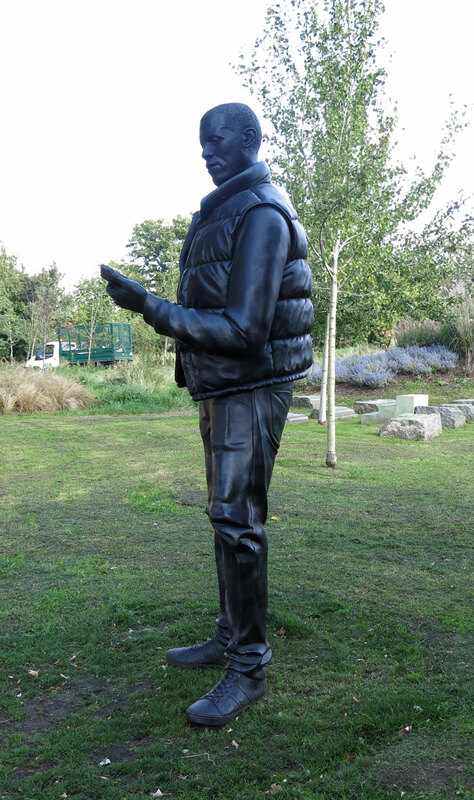 Not to be confused with Johnny Cash, The Line is a sculpture trail between the Olympic Park and the O2 Stadium that roughly traces the Greenwich Meridian. It follows the course of the tidal Lee between Three Mills and Cody Dock from where it continues to North Greenwich via the Royal Victoria Dock and the Emirates Airline Cable Car. This project is an initiative of art dealer Megan Piper, in collaboration with Clive Dutton, to create an outdoor exhibition space open to residents and the visiting public; it provides the opportunity to see lesser-known works by better-known artists in a lesser-known area of London. While it is a great opportunity to experience contemporary artworks on a day out, it is probably fair to say that none of these works was either conceived or selected because of any thematic connection with the location other than considerations of access and visibility. It would be easy to criticise the trail on the basis that it does not correspond to something that was never intended, but this should not detract from the experience of an orthodox but upmarket sculpture trail in a workaday landscape. It could be an advance guard of the metropolitan aspirations of an edgeland landscape that will sooner or later succumb to the growth of the city eastward. The forces of regeneration are incrementally at work to make this area of London more acceptable and inviting and the sculpture trail is in the vanguard, working in tandem with improvements to habitat and accessibility under the auspices of the Lee Valley Regional Park Authority. Between Three Mills and Cody Dock, the trail punctuates the Fat Walk (see preceding chapter). The immediate landscape of the path has been softened by planting undertaken by the charitable organisation Thames 21; its riverside fringe has undergone a great deal of environmental enhancement, which also serves to soften and disguise the utilitarian flood management function of the tidal channel. The sculpture trail provides clues to a thread that draws the visitor into a hitherto uncelebrated part of East London. It is not unusual within urban regeneration programmes to use artwork to connote a sense of caring; where historically a site might have been considered hazardous to visit, artworks can create a domesticating effect, apparently making it feel cared for and therefore safer to visit. 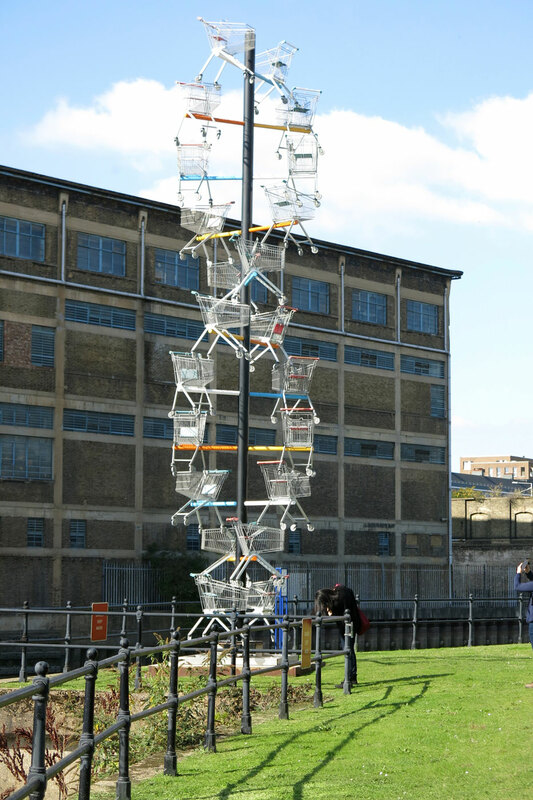 Although no thematic link will have been intended, there is marvellous serendipity in the double helix tower made of shopping trolleys, “DNA DL90” by Abigail Fallis, standing right on the bank of the Lee. While this is as an allegory of the hold that consumerism has upon our society to the extent that it has become integral to our genetic make-up, its present location combined with the monumentalisation of the shopping trolley makes it doubly ironic. The works along the way appear to be opportunist; it is not apparent that they should connect in any way, each one is a self-contained item and consequently there is sufficient distance between them to ensure that no cross-contamination of the viewing experience will happen. The Line becomes a guessing game since the absence of explicit context adds its own level of confusion. At Cody Dock what at first sight is an overblown gateau set on the cropped grass turns out to be “Sensation” by Damien Hirst from the “In-A-Gadda-Da-Vida” exhibition (Tate Gallery, 2004); it represents a cross-section of the human dermis, colour-coded like a textbook diagram. Knowledge vies with sensual pleasure when the work is experienced directly away from the promotional machinery of the gallery. It can also be in conflict or unwitting harmony with the urban streetscape when experienced out of context, to the extent that the steel girder “Work 700” by Martin Creed at the Royal Victoria Dock appears to be a part of street furniture when you lean over it to look for the art. Aside from the directly borrowed or commissioned works, there are several others already on site that have been co-opted into The Line. 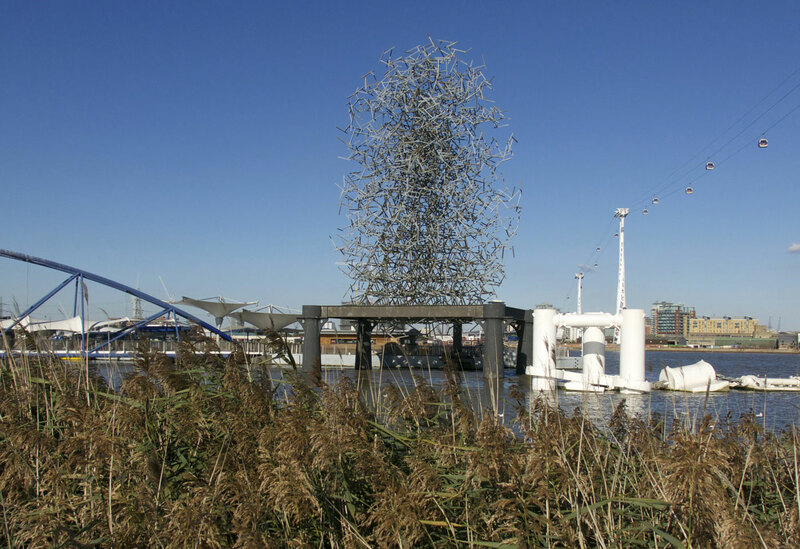 These include Anthony Gormley’s “Quantum Cloud” that I first experienced when it was commissioned for the Millennium celebrations, when it stood in splendid isolation on its own pier; and as you walked past, according to your parallax relation to it, a figure magically coalesced from a cloud of steel. Now, like many of our visitor hotspots, the site has gone mad; the sculpture still exists but is dwarfed by the white pylons for the cable car and the pontoons put in place to ensure that shipping will not collide with them. The Thames Clipper jetty at north Greenwich is immediately adjacent, further cluttering the view of the work with its pontoon, canopies, timber waiting room and ticket office. In typical British fashion of never leaving well alone and where there is space, why not cram in another piece of infrastructure, the Gormley sculpture appears beleaguered and its impact siphoned away. Just around the corner on the foreshore stands another veteran of the Millennium celebrations. This is “Slice of Reality”, the centre section of a condemned dredging ship; the bridge is still used by artist Richard Wilson as an office/drawing room while his son uses the deck below for drum practice. Other works have now joined this eclectic mix, including Alex Chinneck’s “A Bullet from a Shooting Star”, a replica of an electricity pylon precariously balanced on its tip. Commissioned by London Design Festival in collaboration with Greenwich Peninsula, this has come to stay for the time being until the vacant real estate opportunity that it occupies is realised. Until then it remains, a light-hearted but heavy-handed gag that nonetheless is an agreeable surprise when you chance upon it. Perhaps this seems an unnecessarily jaundiced view, but I have to admit to severe misgivings over the relationship between the longevity of art in a public place and the job it is expected to do. In this respect, were it not so outrageously compromised by the infrastructure that now surrounds it, I would say that the sculpture by Antony Gormley alone retains the power to intrigue and if I were consultant for the site, I would recommend its immediate relocation to where it can function as it was originally intended. The Thomson and Craighead signpost showing the distance that it is away from itself around the Greenwich Meridian is another one-liner and just as well that its presence is temporary. The reification of an idea as an artefact is always problematic and I guess that the signpost denoting “Here” is a fine example since it has to be present to be what it is but intrinsically can never be any more than what it is: a statement of the obvious. The Line is a metropolitan initiative and, as such, it is perfectly predictable that works reflecting Britain’s place in the global art world should predominate. Although it is disappointing that an opportunity like this should respond to the exclusivity of the art market, it is worthwhile remembering that this is the principal mechanism through which art as artefact is disseminated. Art that addresses the identity of specific locations or concerns generally happens via quite different and rather more obscure mechanisms. This project is geared to a particularly orthodox view and purpose for the art object and in this instance is predicated upon the assumption that the landscape it occurs within is for the time being its showcase and that the overriding sentiment is of the magnanimity of the exercise that could, to the more critical viewer, be overweening self-regard. Taken overall, once we accept the premise of a sculpture trail for namedroppers, I am surprised at finding myself in favour of the Damien Hirst work, purely on the basis that it is immediately engaging and seems to be what it isn’t. The principle that I follow is that the work should keep on giving no matter how often it is viewed; this would be the case with Gormley’s “Quantum Cloud” if it had not become crowded out by the urban paraphernalia of the site. Standing prominent above the water on the quayside at the Royal Victoria Dock, “Vulcan” by Eduardo Paolozzi is a vintage work. Belonging to the established tradition of the freestanding monumental figure, it is an habitué of sites such as this, notwithstanding the inherited discourse of the man-machine. It is a stereotype in a stereotypical location, but can be greeted like an old and trusted friend who holds no surprises and is part of the furniture. The trail ends at the O2 Stadium, where the immense stainless stainless-steel twisted Obelisk seems to mark its terminus. This work does not appear to be credited to a specific artist and therefore occupies a peculiar limbo as a “not art” artwork. So perhaps it is fitting that this short journey through nameable names is completed at an apparently anonymous architectural feature. 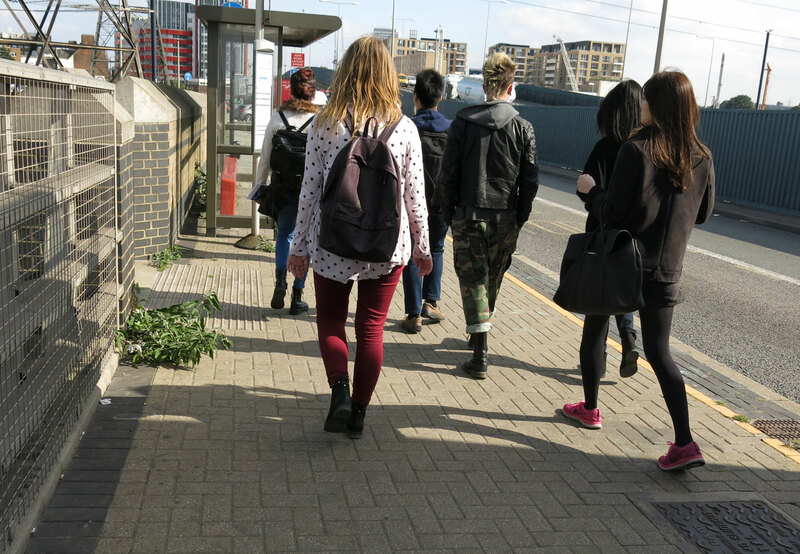 My purpose for the walk was to take advantage of The Line to introduce fourteen students from the new intake of the Middlesex University BA Fine Art Programme to art in the London cityscape and to experience it for myself. We do this exercise in one form or another every year and as such it is an excuse to meet the students informally, introduce them to each other, perhaps get lost, and not to forget the experience of art outside of the gallery context. From Bromley-by-Bow Underground Station, a short walk beneath the busy main road and right turn by Tesco brings us to Three Mills. This is an incongruously impressive heritage site lurking in the shadow of a post-industrial wasteland and is an appropriate staging post for a relaxed stroll through East London’s changing landscape. However, it was not to turn out quite this way since, before long – in fact just after the first sculpture – the day began to take its own course. The signs were inconsistent and the directions unclear, causing us to become entangled in a labyrinth of recycling compounds, dogs barking behind chain link fencing and an old pub with UKIP posters in the window. This was more of a cultural experience than originally planned, and as the requests for the toilet became more urgent the novelty began to wear thin. This is one of those places where you can see where you are and where you should be if you look over the barriers, but getting there is another matter. Surrounded by familiarity but unable to reach it – the river is to the left and the Olympic Park behind us – the roads conspire to lead us away from rather than towards our first stop at Cody Dock. This area is a fragment of the ruined no man’s land of portakabins, containers and scrapyards that characterised the area between Bow and Stratford before the construction of the Olympic Park. For those able to remember, it is redolent of old London gangland and has probably not changed a great deal since the reign of Ronnie and Reggie Kray. This is London, where it is always easy to stray into alien territory, particularly in the East End where the landscape is so dynamic and prone to transformation within the space of a year as the inexorable tide of gentrification works its way East. After enquiring at a reassuringly friendly UKIP pub and resorting to GPS, we arrived eventually at Cody Dock, realising along the way that if only we had doubled back earlier, we could have crossed a bridge that would have taken us down the “Fat Walk” and into Cody Dock by the back door. At Cody Dock, Simon Myers, the director informed us that we could buy neither lunch nor hot drinks because the electricity supply had broken down, but he would give us a brief introduction to the Cody Dock project and point us in the direction of the Abigail Fallis shopping trolley tower and Damien Hirst’s monumental slice of skin. Next stop was to be the Royal Victoria Dock via Star Lane DLR station, where two of our party took the opportunity to take a train in the opposite direction and head back to civilisation. At the Royal Victoria Dock the group dwindled a little more, possibly because the day was getting on and they had had enough and very likely because the escape route via the station was too tempting. This was a pity since another cultural experience lay ahead on the Emirates Airline Cable Car over the river to North Greenwich and the final stage of the trail. Here we mislaid another member of the group when we boarded the cable car and only realised that she was no longer with us once we were suspended over the river. Although she followed us across the river, the scent must have gone cold because she did not catch up with us for the remainder of the walk. So, by the time we reached the end of the trail outside the O2 Stadium at the base of the Obelisk, we were down to nine, which by the normal standards for a first expedition over quite a long day was not at all bad. I have used my perambulations through the Lee Valley to discuss the use of art where it has occurred and in each case have reflected upon its purpose either overtly stated or implied. The approach to The Line is distinct from the use of art within the Olympic Park where there is a blurred distinction between landscape features and sculpture (it nevertheless plays to local conditions including the site itself its purpose and the mechanism whereby it came about). In less high-profile locations such as the Sustrans cycle route or the Upper Lea Valley Walk at Luton different criteria apply for commissioning work circumscribed by the intended public use of the location. The Line is a continuing story: more pieces are being added to the trail and those already in place will be changed. However, I doubt very much that the driving principle will change. So far as I can gather, the current works are loaned on a two-yearly cycle and although the approach will continue to reflect an opportunistic approach on the basis of who knows who, it is nevertheless a welcome initiative. Just as at Trinity Buoy Wharf, there is a tendency not to know when to stop: you cannot see the site for the art or the art for the site. Perhaps it is the premium on space in a crowded island that makes this normal or perhaps it is the propensity to take the utmost advantage of every opportunity. Whatever the reason, the outcome frequently is that quality tends to be submerged in visual clutter. Although it is a welcome initiative, the approach to this project does very little to address the problematic of the work of art in the public environment. It reflects a very conservative and not always appropriate use of art and artists where the conversation that art can have with place as a component and commentary is much more of a challenge. In this instance art is an add-on and its use is unclear; it would benefit from a more strategic approach to commissioning or selection. This is not to say that it should be used instrumentally as appears to be the policy for the Olympic Park, which caused the “Arcelor Mittal Orbit” by Anish Kapoor to be so heavily compromised to the extent that any purpose, poetry or meaning has long since leached away.